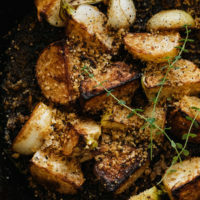 Pan-Fried Turnips with Thyme and Breadcrumbs | Naturally. When spring hits, it’s easy to get excited about asparagus and strawberries. I get it, I do that too. However, there are some other items that deserve your attention. Take for example, the hakurei turnip. 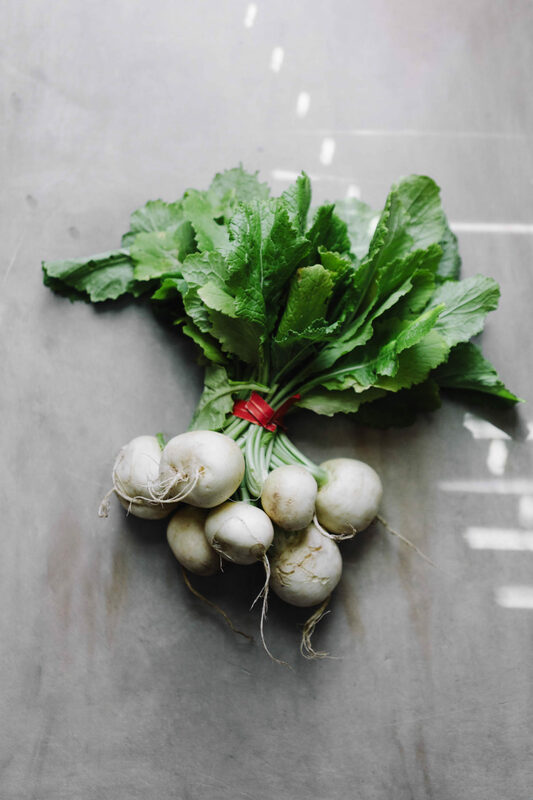 These turnips are a bit more mild in flavor compared to the larger variety- and that goes for both the roots and greens. While you can eat hakurei turnips raw, these pan-fried turnips deserve a try. I don’t like to overcook them but with a nice char on the outside, the flavor is the best of the raw and the cooked flavor. I tried this recipe with and without shallots. You can certainly add a member of the allium family but I found no matter what I tried, the flavor overpowered the turnips. Herbs: Swap out the thyme for parsley or tarragon. You could also just leave the herbs out and do a bit of salt and pepper. These fried turnips can hold their own. Vegan: I love the flavor the ghee brings but if you’re going vegan, just swap it out for olive oil. Gluten-free: I think the breadcrumbs make the turnips but that could be the bread-love in me talking. You can always pick up gluten-free breadcrumbs or try your hand at making your own. Turnips are one of the vegetables that is easy to ignore but shouldn’t. They have what I find to be the perfect balance of butteriness and earthiness (compared to other roots that are all earthy flavor). They are great roasted, grilled, and can be thrown into stir fries. I think the best part of turnips, however, are the greens. They aren’t over-powering and can be used as you would chard, kale, or beet greens. Want more turnips in your life? These pan-fried turnips are an easy way to prepare an under-utilized vegetable. Look for the smaller turnip variety called hakurei- the flavor is a bit more mild and great for people who don’t always like turnips. Trim the turnips, leaving about an inch of the greens on top. Cut the turnips into quarters. Place a medium pan over medium-low heat. Add the ghee to the pan, followed by the turnips and salt. Cooking, turning only a couple times, until the turnips are browning and tender; 6 to 8 minutes. Once the turnips are just about done, stir in the thyme and cook for another minute or so. 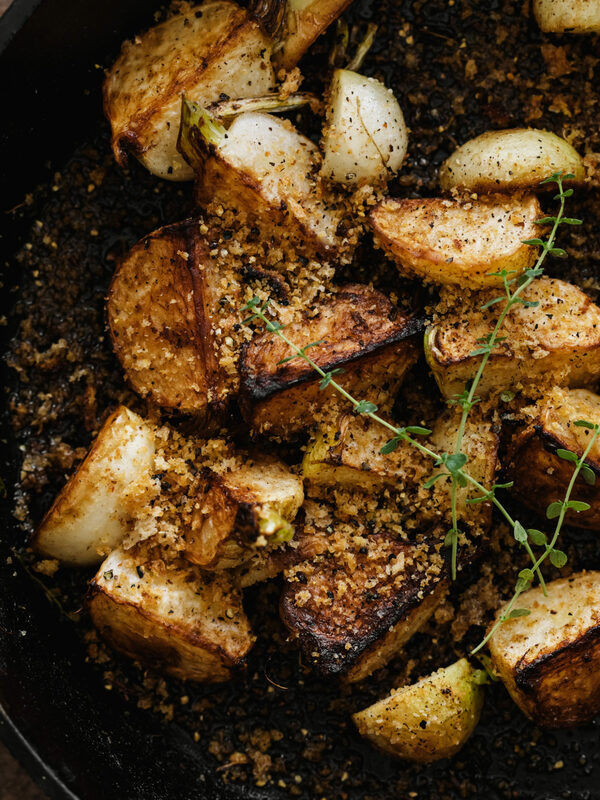 Once the turnips are done, sprinkle with breadcrumbs before serving. Tips + Tricks: Can’t find hakurei turnips? Use regular turnips cut into 1/2″ cubes. Well I need to search for these turnips! I’ve never even heard of them! Love the thyme in your recipe. I think it’s an underappreciated herb. I even use a lot of dried thyme.